1. Durrow. South Side. General View of Shaft. This sandstone cross is situated near an unused Protestant Church. Its measurements are 3.16 m high x 1.39 m at the arms . The shaft measures 46 cm x 31 cm. The base measures 1.3 m x 1.1 m and 58 cm high. This is a view of the south side of the shaft of the cross at Durrow, Co. Offaly. S1 Eve gives the apple to Adam. Old Testament. Book of Genesis 3. S2 Cain kills Abel. Old Testament. Book of Genesis 4:8. Cullen, L. M., The High Crosses of Ireland and the Book of Kells 1, , Dublin (c.1905) . Gsanger, H., Irland, Insel des Abel. Die Irischen Hochkreuz 1, , Freiburg i. Br. (1972) . Henry, F., , ‘A Cross at Durrow (Offaly)’. In Journal of the Royal Society of Antiquaries of Ireland (1963) 93, 83-84. Henry, F., Irish Art in the Romanesque Period (1020-1170 A.D.) 1, , London (1970) . 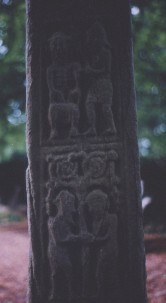 Morris, H., , ‘The Muiredach Cross at Monasterboice, a new interpretation of three of its panels’. In Journal of the Royal Society of Antiquaries of Ireland (1934) 64, 203-212. Ó Murchadha, D., , ‘Rubbings taken of the Inscriptions on the Cross of the Scriptures, Clonmacnois’. In Journal of the Royal Society of Antiquaries of Ireland (1980) 110, 47-51. Porter, A. K., , ‘Notes on Irish Crosses’. In Konsthistoriska studier tillagnade Johnny Roosval. Studier fran zornska Institutet for Nordisk ich jamforande Konsthistoria vid Stockholms Hogskola VI (1929) 85-94. Smyth, A. P., Scandinavian York and Dublin. The History and Archaeology of two related Viking Kingdoms II 1, , New Jersey/Dublin (1979) . Stokes, M., The High Crosses of Castledermot and Durrow 1, , Dublin (1898) . Williams, S. de C., , ‘The Old Graveyards in Durrow Parish’. In Journal of the Royal Society of Antiquaries of Ireland (1897) 27, 128-149.